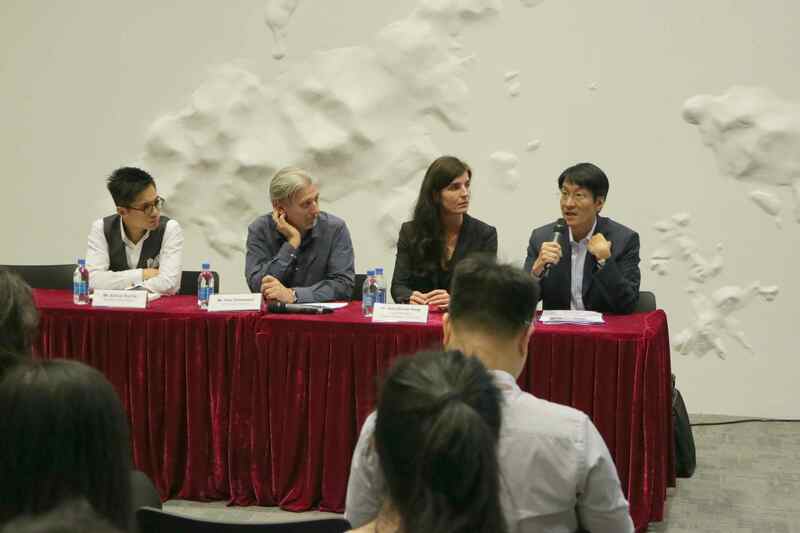 The dialogue concentrated on integrated urban redevelopment, explained through presentations and discussion comparing two concrete urban regeneration projects in Vienna and Hong Kong. The Energizing Kowloon East Office (EKEO) is a decentralized district office under the Development Bureau of the Hong Kong Government. It is part of the efforts to redevelop the area of the former Kai Tak Airport, Kwun Tong and the Kowloon Bay Business areas. The district used to be an important industrial base, until the relocation of manufacturing to China and the closure of the Chek Lap Kok Airport left a considerable amount of land and buildings unutilized. The project aims to bring new vibrancy to Kowloon East by turning it into a part of the planned Central Business District 2 (CBD2) and providing quality green and recreation spaces for the public. The prospects for initiating various ‘smart city’ initiatives in the area are now under study. The EU-co-funded project ‘Smarter Together’ brings together eight cities to demonstrate ‘smart solutions’ and learn from each other. Within that frame, Vienna is responsible for a lighthouse project in its Simmering district. Simmering has a mixed industrial and relatively low-income residential structure, with a post-war housing stock in need of upgrading and retrofitting. The project includes measures to improve citizen engagement, e-mobility, buildings renovation, district heating and renewable energy systems. The Simmering working group also participates in knowledge sharing in urban, national and international contexts. The debate revolved around challenges to the implementation of the regeneration projects, bureaucratic and financial aspects, as well as difficulties associated with working in cooperation with different sectors and tiers of governance. In his presentation Mr. Frank Wong talked about the physical regeneration and the ‘smart city’ dimension of the Kowloon East district renewal. Although the primary aim is to turn the Kai Tak//Kwun Tong area into another core business district, improvements of the quality of living is also an essential and important component. It is reflected, for example, in the transformation of the former harbor front logistics area into the Kwun Tong Promenade, where seats, greenery and public facilities have been added and administrative restrictions on the use of public space lessened. Mr. Wong presented numerous “quick win” improvements carried out to make the neighborhood greener and more citizen-friendly. For instance, in one of the public spaces a fencing wall was dismantled to create a more open and welcoming atmosphere. The roads were made more attractive for pedestrians by growing plants at street corners, relocating crossings, and preventing illegal parking. Greening works were also carried out near the Kwun Tong Promenade and along Hoi Bun Road. In order to encourage secondary pedestrian flows in the district, under-utilized back alleys became graffiti zones for artists, with permission of private building owners. A ‘BackStreet Run’ was also organized to draw public attention. There was no need for the Legislative Council’s approval, which would have taken a long time to process. Instead, the EKEO opted for a larger number of such small-scale urban interventions. These actions constitute immediate responses to problems in the neighborhood. Mr. Wong explained that the Kowloon East project tries to preserve memories of the district’s history. There was, for example, an initiative converting electric switch-boxes on road sides into an exhibition route about the industrial heritage of the place (‘Spirit of Creation’), while the Tsun Yip Street Playground was transformed into an open-air gallery of Hong Kong industrial culture. With a view to enliven public space and enhance the community spirit, the EKEO organized a ‘Fly the Flyover Operation’ so as to provide an open-air venue underneath the Kwun Tong Bypass for leisure actvities, workshops, performances and other events. The next step is to link up this venue with the new waterfront. So as to make the district cleaner and healthier, the renaturization of the former Kai Tak nullah has already started and will provide a park and river environment for leisure activities. Dedicated cycling tracks will provide ‘green connectivity’ corridors throughout the district. Changes in the Kwun Tong Shelter Bay are planned already so as to make it suitable for water sports activities. It is also proposed to construct an ‘Environmentally Friendly Linkage System’ (monorail system) along the old airport runway and six spines of elevated walkways between Kwun Tong residential areas and the Kai Tak runway, thereby improving transport links and walkability in the district. Mr. Wong mentioned that the government offers a land premium waiver as an incentive for developers to provide the walkways network. But turning Kowloon East into a new business district will also require more space for commercial purposes. Therefore, more land will be obtained by the relocation of the Vehicle Examination Centres to Tsing Yi. Eventually, Kwun Tong will form part of the overall new CBD2 and the planned tourism hub ‘Kai Tak 2.0’. For the time being, it can serve as a form of Urban Lab to try and test ‘smart’ urban measures. Mr. Wong talked about the potential of launching further ‘smart city’ measures in Kowloon East. Forums with district council members, IT experts and the public are under way to come up with new ideas. For instance, apps could be used for the coordination of traffic flows when events are organized and may cause traffic disruption. Installing smart energy and water meters could increase energy efficiency and water savings. Technology could also help to measure the water quality to decide whether it is suitable for water sports, or improve waste management by introducing bins, which can detect the level and type of rubbish. The district’s problem with illegal parking could be eased by installing sensors to monitor the time of track loading/unloading, but it would require more cooperation with the police to make use of the collected data. Another suggestion is ‘Smart Tree Mangement’ which electronically monitors growth and health of all trees in the district. Apps for the public could combine various indicators and provide advice on route planning (e.g. choose best route for the disabled, or indicate air pollution levels by street so that people with respiratory problems could avoid them). A system of electronically managed ‘logistics lockers’ near MTR station would be convenient to citizens and improve air quality by reducing delivery traffic. According to Mr. Wong, listening and responding to public concerns and cooperation among government departments and other utility companies will be the key to successful district development. Dr. Julia Girardi-Hoog presented ‘Smarter Together’, a smart city lighthouse project involving Vienna, Munich and Lyon as the frontrunner cities. The project focused on resource efficiency and innovation, but in the case of Vienna, it also has very strong quality of life and social inclusion components. An emphasis is being put on co-creation between partners from industry, municipal departments, and citizens. Dr. Girardi-Hoog highlighted that the project brought a new approach to knowledge management and cross-sectoral thinking to the city. The concept of the quality of life itself has been extremely helpful to create synergies between various policy fields such as housing and transport. It has enabled different departments (which tend to work separately) to come together. ‘Smarter Together’ is therefore also, in a decisive way, an experiment in ‘governance learning’. One of challenges the city faces is the creation of awareness among neighborhood residents that improvement is actually possible. Dr. Girardi-Hoog explained that general forums proved to be ineffective, because only those participants spoke out who already had a critical attitude. Meetings now take on the small brainstorming groups, which develop ideas for house renovations and refurbishments, mobility improvements, etc., which can be seen as concrete realizations of the city’s wider strategic goals. Residents are asked first to imagine how their district should look like in 2030 so as to increase the quality of living for their own children. ‘Smarter Together’ in Vienna covers the district of Simmering. It is characterized by post-war subsidized housing, relatively low education levels, a mixture of residents of various ages and a high share of immigrants (37%), which at times makes it difficult to reconcile conflicting interests. However, the project is committed to pose challenging tasks (such as introduction of e-bike sharing), believing that it is a chance to gain lessons valuable to the entire city. Effective methods can then be replicated elsewhere. Dr. Girardi-Hoog stressed that ‘smart’ does not necessarily mean brand new ideas and the implementation of high-tech tools. Instead it aims at citizen-centric, simple but clever solutions that work well. For example, Vienna’s system of subsidized housing is seen as smart in itself (although not yet seen as sufficient). The existing housing stock can be seen as a base for future-oriented sustainable urban planning, provided that the tenants of these housing estates are taken seriously when making suggestions. The project therefore tries to use the overall urban development narrative (as expressed in the Smart City Framework Strategy) as a structural tool to help citizens generate proposals for the reduction of energy consumption, the improvement of building insulation, alternative energy provision or the promotion of changes in citizens’ heating habits. For attracting residents to focus groups and foster citizen engagement, the project makes use of a ‘SIMmobil’, an open street contact point which can be stationed at many gathering places throughout the district. Initially, it was important for city administration to overcome negative perceptions about the neighborhood itself, talk to the residents directly and try to convince them of the lomg-term benefits of the project. The core task of ‘Smarter Together’ is the refurbishment of housing and the surrounding public spaces. It is planned to install photovoltaic panels on residential buildings. Solar heat and waste heat will be integrated in an energy-efficient district heating system. The project also provided a local school with a new ‘zero-energy gymnasium’ as a showcase for the developmental direction of the entire district. In other examples, the refurbishment of housing (Lorystraße) will change empty storage spaces into community rooms and revitalize a nearby park. Despite conflicting interests among residents, it has so far been possible to reach compromises with the help of social workers. Residents are also encouraged to formulate ‘wish lists’, which are then passed on to planners. The planners later return to citizen meetings to explain how this wishes could/could not be developed within the district’s overall urban development strategy. In the area of mobility and transport, the project experiments with intermodal ‘mobility points’ which combine e-bike and e-car sharing spots, parking lots and other facilities of high usability such as ATMs or post boxes. Dr. Girardi-Hoog mentioned that although it is initially difficult to convince citizens of the value of novel ideas such as e-biking, other elements within the same strategic development category can gradually make a difference – as, for example, e-bike usage for grocery transport or the introduction of so-called ‘strawberry benches’. The latter are public benches with a roof equipped with solar panels; they also have sockets for free mobile phone charging and free W-LAN access. Larger sub-projects in the district include e-logistics on industrial sites, to be developed and tested by Siemens, an industry partner in the ‘Smater Together’ consortium. The Austrian Post will test the use of e-vans in parcel delivery. The follow-up discussion touched on difficulties associated with the implementation of such projects. Mr. Wong admitted interventions like the relocation of the Vehicle Examination Centres to Tsing Yi often trigger ‘not-in-my-back-yard’ responses among different stakeholders, and they have to be preceded by careful planning and studies. It is also challenging to cooperate with different administrative departments. Dr. Girardi-Hoog confirmed this and quoted as an example that e-bike sharing in Vienna meets regulatory obstacles because young people below 16 cannot use renting schemes of this sort. It would also be necessary on a continual basis to organize events and guided tours tailored to different groups and to demonstrate and discuss the value of urban renewal measures with citizens. As for ‘smart city’ apps, the EKEO in Hong Kong wants to test the possibility of combining different types of apps-based public services in one tool, although the technical problems have not yet been resolved. By contrast, Vienna already has an open data platform which allows any interested parties to develop their own smart applications freely. The speakers discussed the degree of freedom districts and neighborhoods have in carrying out projects without involving top administrative levels. Dr. Girardi-Hoog said that in Vienna decisions are made on the district level. It is therefore important to convince district boards. But there are differences between the budgets of different districts, and funding for refurbishments comes from the city level as well. As in the case of ‘Smarter Together’, additional funding is provided by the European Union, but the EU also expects projects to incorporate cities and businesses. In Hong Kong, the EKEO has to consult other government departments on principle, where sometimes renewal ideas are confronted with strict regulations. For example, plans to transform space in an industrial building into a studio for performing arts could not be realized due to concerns over building fire safety. In general, the specificity of a particular project indicates whether the decisions should be made at the district or higher governmental levels. It was agreed that there is no clear-cut definition of concept and rationale behind the term ‘smart’, despite it having become a buzzword in many contexts. The panelists were of the opinion that ‘smart’ is not merely about bringing in new technologies, but rather their use to develop solutions to existing problems. ‘Smart’ also always involves the training of people to become ‘smarter’ in the context of urban development objectives. Cities in Europe have additional incentives to become ‘smarter’ because there is actual competition between them. They compete as business locations, but also (partly) for EU funding. It is therefore important for them to be part of a wide urban development discussion across the entire continent and be involved actively in European urban cooperation networks. There is a need as well as the wish always to remain ‘cutting edge’ in light of the Union’s overall strategic development (which includes a strong urban perspective as well). Hong Kong, by contrast, is not a member of such strategic urban networks and therefore often has difficulties to keep abreast of global urban development trends. To some extent, there is no pressing need or incentive to become ‘smart’, other than what immediate local business interests or public opinion dictate. Hong Kong would profit from more flexible government attitudes and a clear political commitment to ‘smart’ urban development regardless of difficulties. While in Vienna there is a general public agreement on sustainability and climate change adaptation as ultimate goals, Hong Kong, despite many good initiatives, lacks a similar level of coherence in its approach. Mr. Zimmerman pointed out that top-level commitment to district improvement is lacking, which also prevents individual administrative departments to forge ahead with better ideas. He suggested that more district offices like the EKEO would go a long way to make Hong Kong a ‘smarter’ city than it currently is. Explaining factors that facilitate decision-making and implementation processes in Vienna, Dr. Girardi-Hoog said that ‘Smarter Together’ indeed has some influence over utility companies because they are owned by the municipality. But even more important is that the EU now requires cross-departmental pragmatic approaches as well as public-private partnerships as a matter of routine. A common public concern in Hong Kong is that urban renewal projects would increase the cost of living for residents, negatively affect vulnerable social groups and finally lead to district gentrification. To avoid these developmental effects, the refurbishment and retrofitting of buildings and flats in Vienna is heavily subsidized, and social inclusion is a major principle of all projects. Finally, the debate turned toward security and privacy concerns in a city with ‘smart’ applications, big data analytics and the ubiquitous use of surveillance cameras and sensors. It was mentioned that the large-scale collection and usage of data could also be a problem in Hong Kong, but that currently most information regarding urban development was actually not publicly accessible (and indeed not even shared among different government departments). In the case of Vienna, only access to sensitive data about households is restricted, while other information is freely available. Mr. Zimmerman suggested that Hong Kong should also share public data in many areas, which could lead to manifold service improvements. Transport operators, for example, should be forced to disclose passenger figures on all routes to provide more transparency in the competitive urban transport market. There was agreement among all participants that the current practice of trading (public) data commercially was highly deplorable.